Merry Christmas Everybody - Unless you live in 1652! The changing face of Christmas food fascinates me. These days English supermarket shelves are full of exotic delights like panetonne and stolen, both almost unknown fifteen years ago. I recently made ten short features for a popular daytime television food series which explored this issue in an historical context. Not in any depth of course, because British daytime television is aimed at a demographic that is mistakenly assumed not to be able to cope with anything too mentally taxing. But I had some fun exploring a lot of lost British seasonal traditions. For instance most have heard of the wild boar's head served as a Yuletide dish 'in days of yore' (daytime television speak). This particular dish has become just as much a stereotypical symbol of 'Christmas Past' as that other latter-day Christmas cliché, the so-called turducken or multi-bird roast. 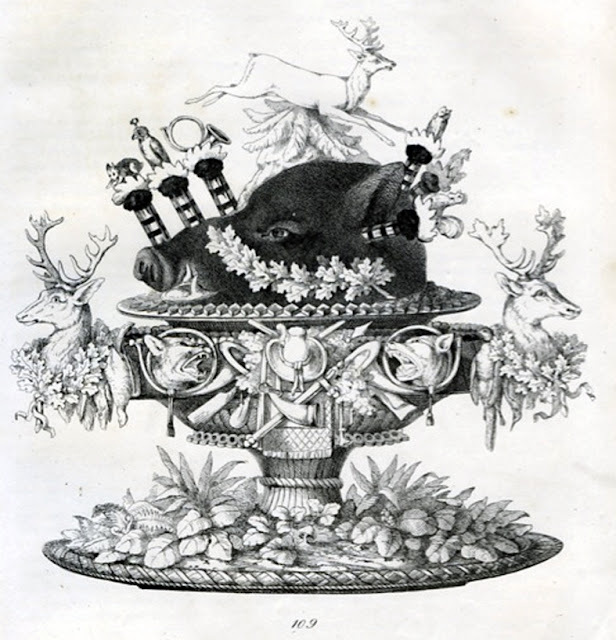 But you may not know that in the Victorian period, boar's heads were imitated in sponge cake, iced with chocolate and stuffed with ice cream - much nicer to eat than the real savoury dish. I had a go at making one of these eccentrically shaped choc ices for the series, which is being screened here in the UK at the moment. 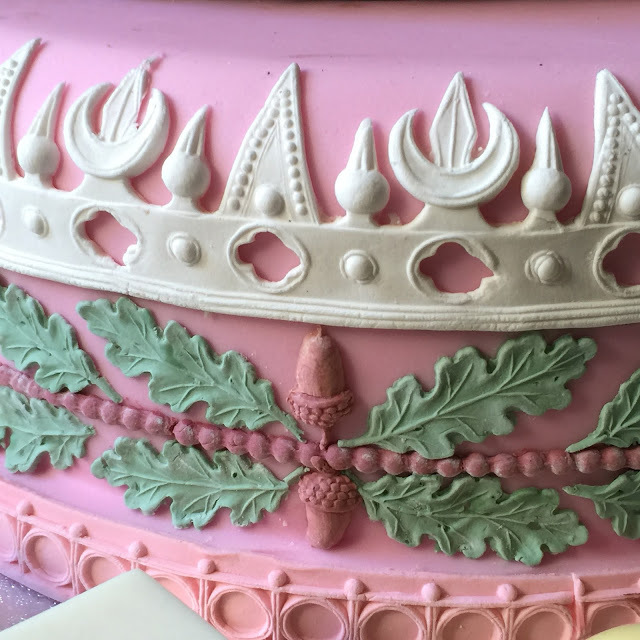 The long and complicated recipe can be found in Charles Elmé Francatelli's superb The Royal English and Foreign Confectionery Book. (London: 1862), together with a delightful chromolithograph of the finished result (above). 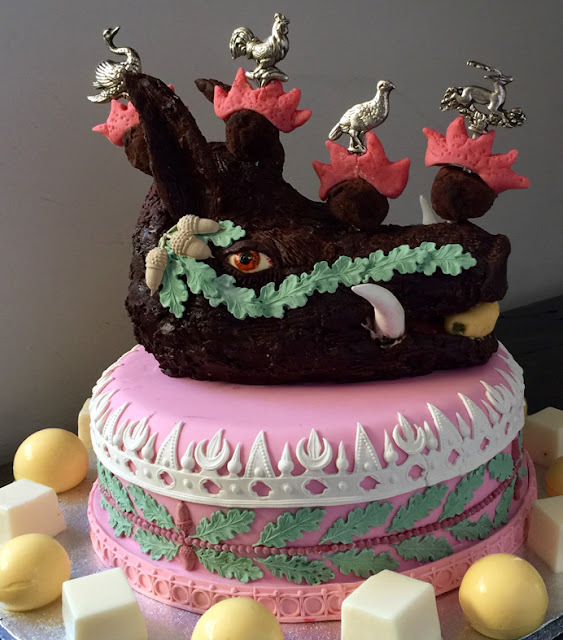 I usually publish a photograph of one of my Twelfth Cakes at Christmas, but this year, here is a version of Francatelli's Imatation Wild Boar Cake. 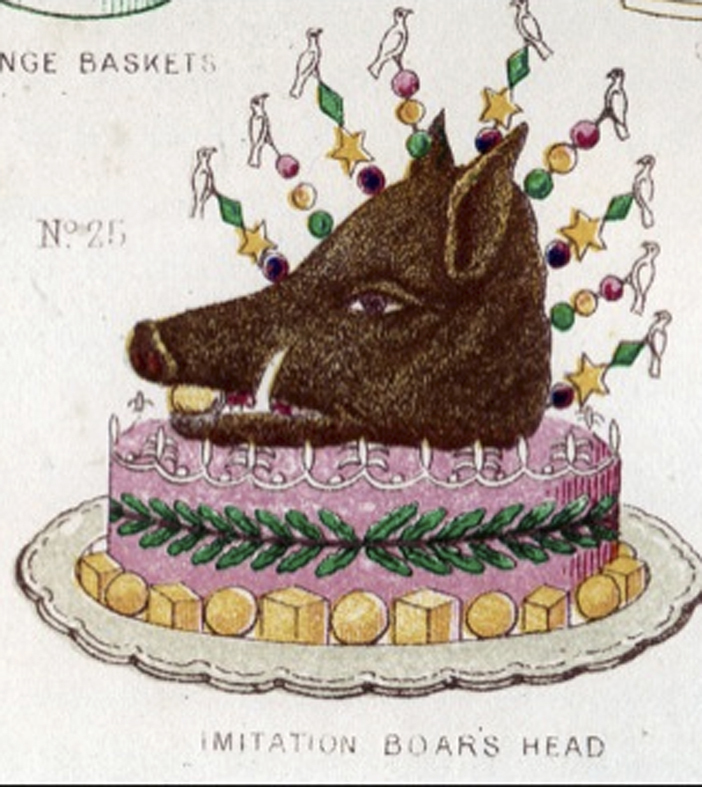 The recipe involves baking a number of savoy cakes in paper cases, joining them together with apricot marmalade and then carving the result into the shape of a wild boar's head. It is then covered in cooked chocolate icing. The ears are made from pate d'office masked with some of the same transparent chocolate icing, the tusks and teeth from gum paste, while the eyes are moulded over marbles from pastillage, which are painted, then dipped in blown sugar to give them a scary, amazingly realistic gloss. After being mounted on an ornamental socle, the head is garnished with silver hatelet skewers impaled with chocolate truffles and marzipan coxcombs. The hollowed-out head is stuffed with white and red ice cream, meant to resemble fat and lean, before being garnished around with white and yellow jelly croutons. Interestingly, this recipe appears to include the earliest mention of chocolate truffles. Francatelli's instructions for garnishing the ornamental skewers does not agree with his illustration. I decorated mine with the garnishes he describes - the imitation truffles and coxcombs, while the chromolithograph shows stars and spheres made out of some unknown material. Real truffles and coxcombs on silver skewers were used to garnish savoury versions of the dish, as in the truly spectacular tête de sanglier above from Emile Bernard and Urbain Dubois's La Cuisine Classique (Paris: 1856). These technically accomplished chefs moulded and carved the fancy stand and leaping deer from fat! 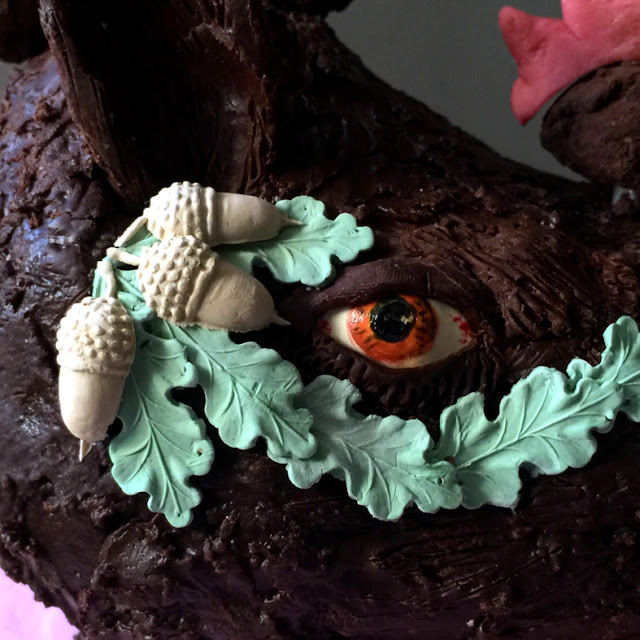 I love their oak leaves and acorns and added a similar pastillage embellishment to my chocolate incarnation. Dubois and Bernard made their highly ornamental tête for Kaiser Wilhelm I. Whether it was really as truly amazing as the engraver has depicted, we will never know. 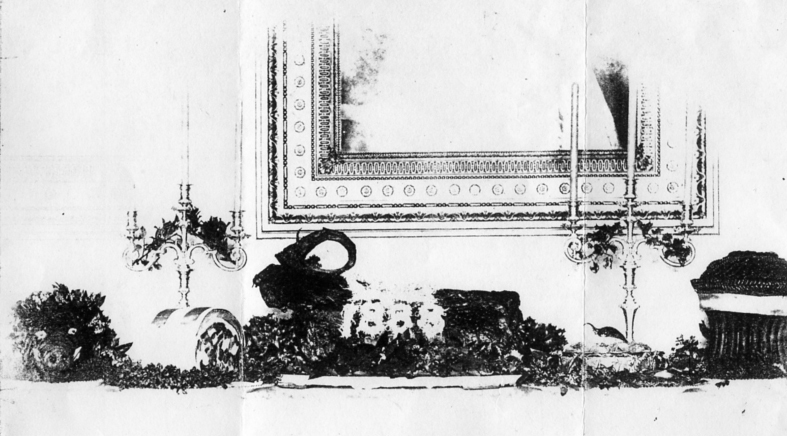 One very faded photograph of another decorated boar's head which graced Queen Victoria's sideboard at Osborne House in 1888 shows that the English branch of the family did not insist on such artistic ambition. This wildly squinting beast has one eye not only larger than the other, but it stares in a different direction! A surprisingly amateur effort for a regal dining room. Coming back to my chocolate piggy, the stand or socle was embellished with oak leaves and other ornaments in gum paste, loosely following Francatelli's scheme. I used what nineteenth century carved wooden moulds I had to hand. 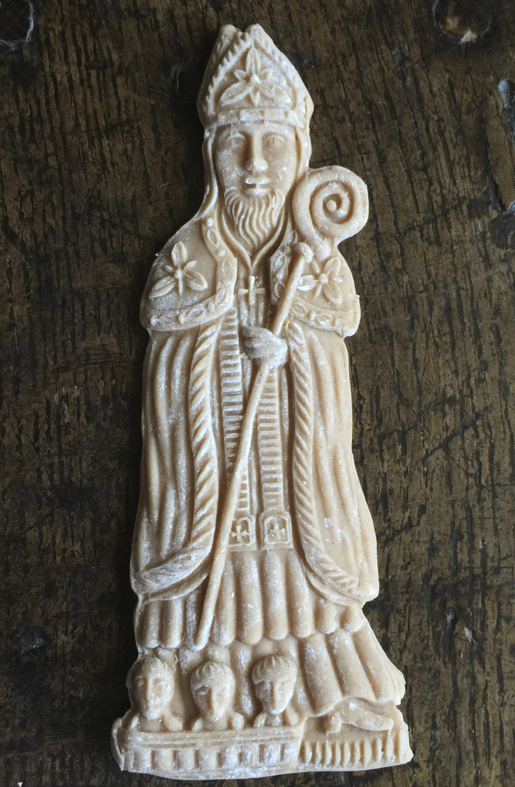 In another episode I explored the strong associations that gingerbread has with Christmas and made a number of moulded figures, including this white gingerbread figure of St Nicholas. The German or Dutch mould was carved in the nineteenth century and belongs to my friend Charlotte Rees. Watch out for Charlotte, she is a food history prodigy. The three little boys sitting in a salting tub were allegedly rescued and brought back to life by St Nicholas. According to the legend, a wicked butcher had killed them and was salting them in preparation for selling them as hams in his shop! The myth was considered too violent for an afternoon teatime BBC audience and did not get explained in the programme. These moulds were used to make gingerbread gifts for children for the feast of St Nicholas on 6th December, usually, at least in the Netherlands, being given on the evening of the 5th December. Those of you who do manage to watch the episode in the series concerned with the subject of wassailing may be mystified by the sudden appearance of a large wooden bowl ornamented with greenery. Unfortunately, the historical source of this object was left out in the final edit, making the whole story a bit open ended and puzzling. So for the benefit of any viewers who might be curious to know what was going on here, here is the source of that mystery object. 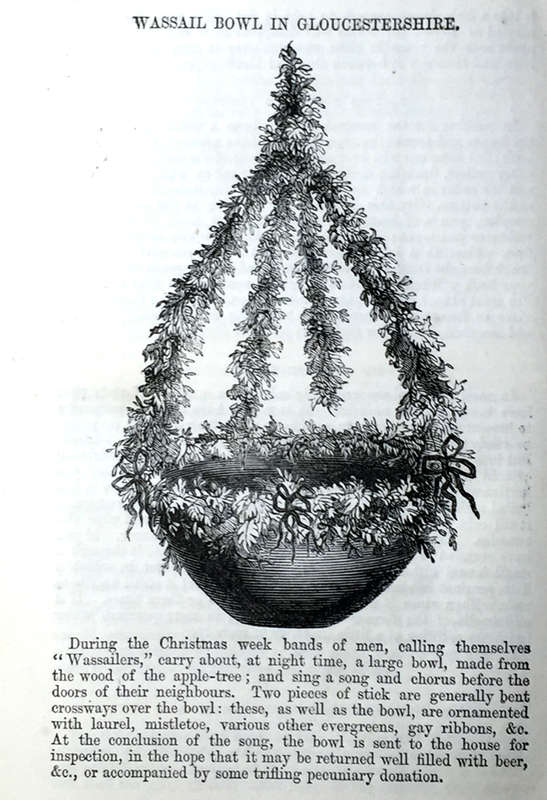 A wassail bowl ornamented with Christmas greenery from Frederick Bishop, The Wife's Own Book of Cookery. (London: 1856). The same illustration appeared in a slightly different format in Bishop's earlier version of this work, The Illustrated London Cookery Book (London: 1852). 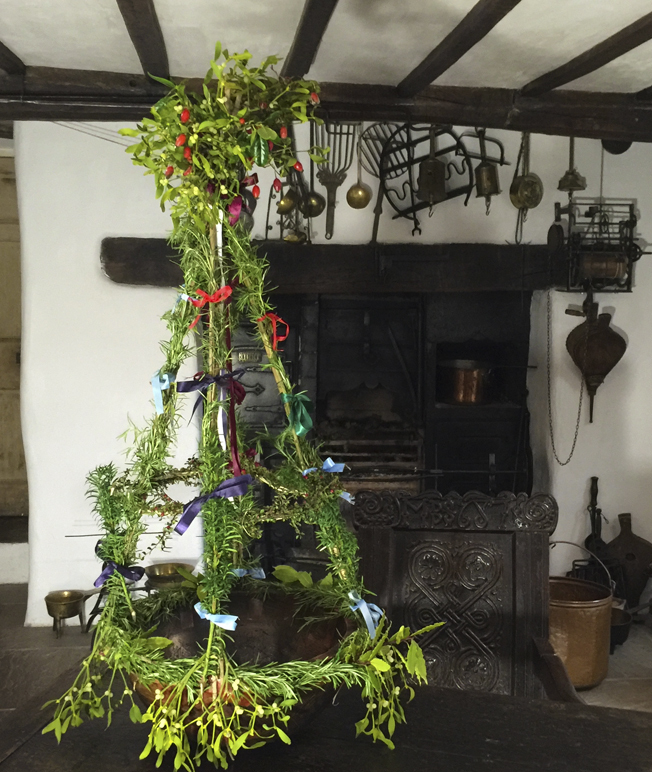 My version of the Gloucester wassail bowl decorated with rosemary, bays and mistletoe. 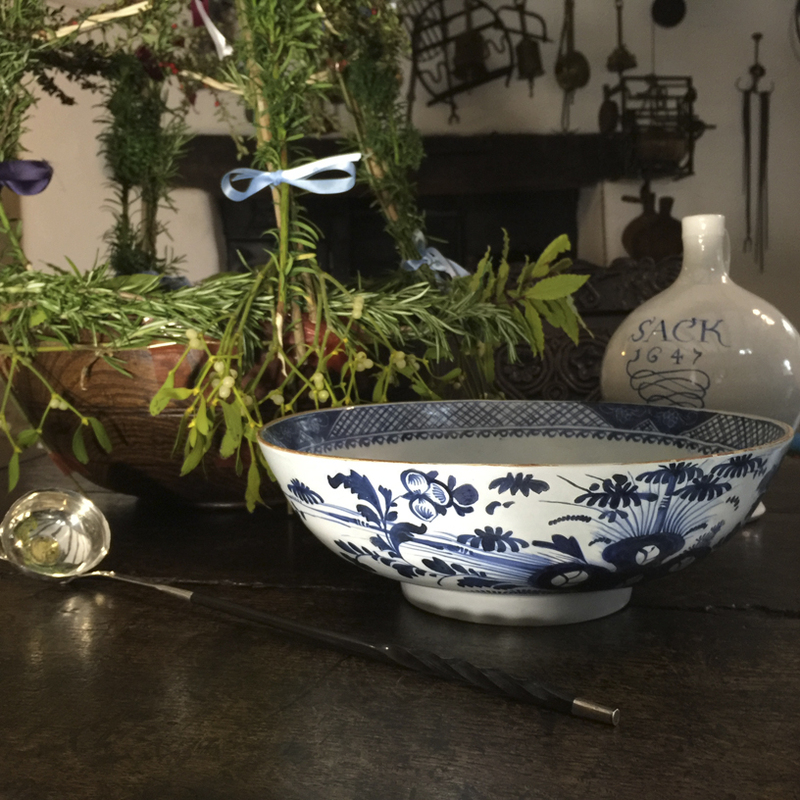 However, my tipple of choice this Christmas in my own home will be some bishop served in a replica of a faience bishop's mitre bowl made by my friend John Hudson. 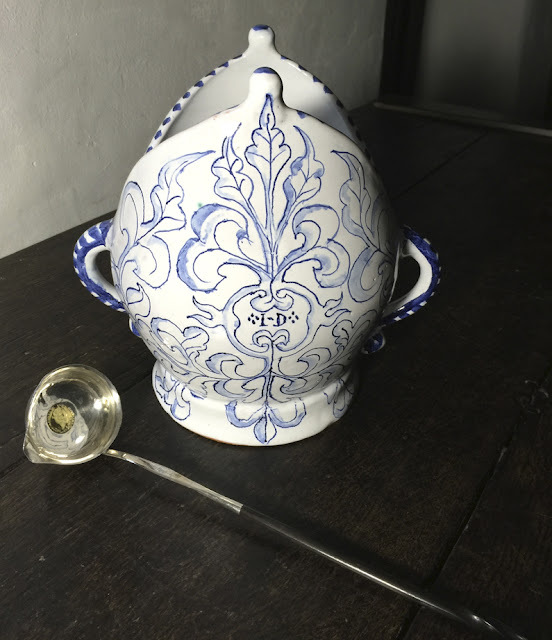 I have already posted a lengthy article about bishop in which I illustrate these rare and curious vessels - Some Christmas Nightcaps. I have looked for an original one of these rare vessels for a long time. As far as I know there are only about five in existence. So I commissioned my potter friend John Hudson to make one for me. And finally another wonderful acquisition. This is the time of year that journalists and celebrity chefs start banging on about how Oliver Cromwell banned minced pies. There is not really any evidence to suggest that this really happened. There are certainly no acts from the commonwealth parliament that specifically outlaw these Christmas pastries, because I have hunted through all of them and have not found any. 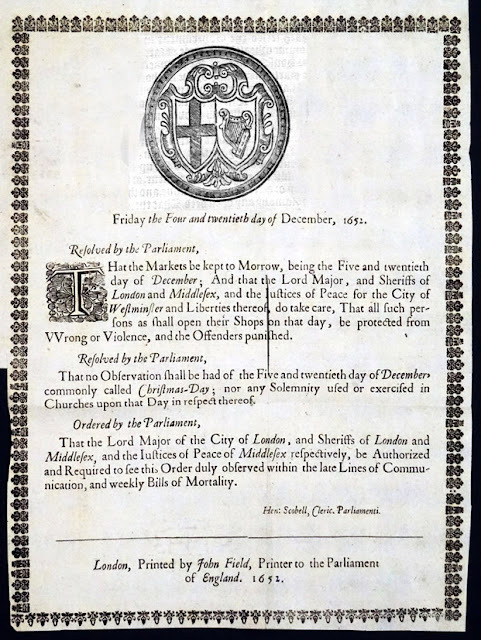 But the Commonwealth did outlaw the celebration of Christmas and I suspect that the stories about forbidden mince pies originate from these parliamentary declarations. It must be understood that England was being administrated at this time by a seventeenth century version of the Taliban, who discouraged all forms of enjoyment. 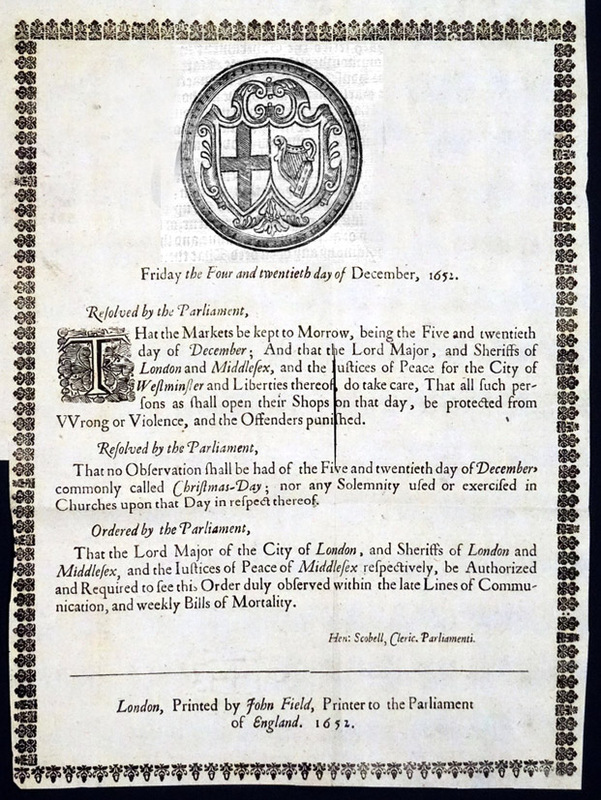 Anyway, a few days ago, I acquired the extraordinary document below, a parliamentary resolution from Christmas Eve 1652 which forbids the observation of Christmas Day - here it is. 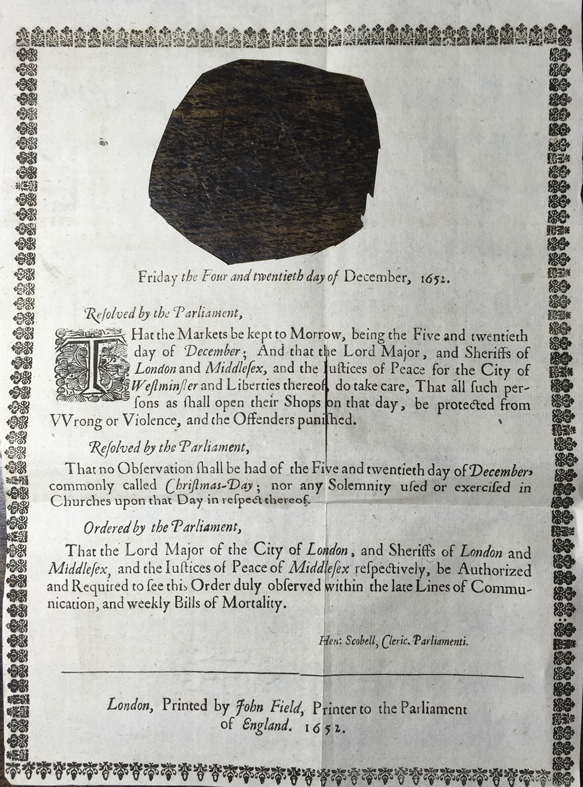 Now this very rare broadside, probably printed so it could be attached to a church door, has been deliberately damaged. Somebody has excised the coat of arms of the commonwealth from the document, probably in an act of defiant vandalism. To me this makes it even more extraordinary. However, to show you what it would have looked like when complete, I have used Photoshop to show you its original appearance. Merry Christmas! If the lady you mentioned is a food history prodigy, what must I call you? That wassail piece you had commissioned is fabulous as is this post. So nice to see a post from you for the holidays and on my birthday. Tis a gift. Well Happy Birthday Donna!! Have a lovely day. I will toast you with a glass of bishop! Never mind those miserable puritans - eat, drink and be merry I say! What a spectacular chocolate piggy! One could envision the excitement upon viewing such a magical beast, perhaps only surpassed by the jubilation of the chef! I'm intrigue as to the name of the television food series you mentioned at the beginning of this entry? Happy Christmas to you Mr.Day, and a prosperous New Year! the programme is called Home Comforts at Christmas and is headed up by British chef James Martin. I just have a short slot in each programme. There are 10 in the series. The chocolate boar's head is in programme 6. A Merry Christmas to you too. best wishes Ivan. That chocolate boars head looks terribly scary! But how skilfully made, as usual! I'm Flemish and it has been years since I heard the story of Sinterklaas saving those children from the butcher. Gosh it was so far in the back of my head I think I haven't heard it since I was a toddler in the 80's. It got a bit forgotten. Probably for being too gruesome. I seem to remember those weren't the first children the butcher had caught to be turned into ham. It goes to show that not only christmas changes through the ages, but how we portray ancient myths and legends too. Now discarded for being to scary, those stories are changed and childhoods altered. I remember how scared I was about the evil surrounding us in the world in winter, you heard about it in all the fairytales. But luckily when Sinterklaas or St. Nickolas came, we would all be safe. And then he's actually most likely Wodan or Odin in a much more ancient time. Accompanied by his two black ravens instead of black men like he is today.The history of this childrens feast has always intrigued me. In slavic countries, Sinterklaas is accompanied by a black devilish figure called Krampus. In Holland the black figure eventually became the helper of the holy man, or the slave. In Flanders they are chimney sweepers who go down the chimneys with gifts for children, hence their black appearance. But bottom line it is all about good and evil, night and day. The oldest story in the book. But I'm drifting of topic now. Foodwise we have indeed our gingerbread, but also pepper nuts (tiny spiced cookies) which are thrown in the corner of the room by the black creatures, to keep away evil that is lurking. Lovely seeing you on the telly saturday! Ah, pfeffernusse! Yum! The ones you buy in the supermarket, year round, are not like the homemade ones, as I discovered when I baked some. I've heard of the Odin as gift giver thing, and I'm guessing you really, really wouldn't want to be on HIS naughty list! Chocolate Boar's Head! Goodness! But am I right in thinking some of those decorations aren't edible? Brilliant information Regula! I have a little book called 'Round about our Coal Fire, or Christmas Entertainments' London 1740. Chapter II is entitled 'Of Hobgoblins, Rawheads and Bloody-bones, Buggybows, Tom-Pokers, Bull-beggars, and such like horrible Bodies'. These are the English equivalents of Krampus and his friends. Children would be told frightening tales around the Christmas fire about these dark creatures. You are right - good and evil was the underlying theme. Hi Sue, It is all edible, that is if you have a sweet tooth. The ornaments are all made of sugar. Ivan, how interesting and intriguing does that little book sound! I have even ordered a Gale Ecco reprint of it to be able to read it over christmas! So the inside of the boar was meant to look like actual meat? If so, do you have any pictures of it cut? Hello. How lovely to get this holiday post. But gee, that's one scary looking dessert! That would have sent me scurrying for cover when I was a child. And those eyes....YIKES! Smile. Happy Holidays.